It was posted on the Parents Magazine Facebook page. Upon reading those comments I discovered that yes, parents really do that. Here’s why I would never. For one, it means a lot of slicing. I don’t like to slice things. I usually buy things pre-sliced. I’d have to get 4 different peppers and slice them into strips. I’d have to buy cauliflower, wash said cauliflower, and then cut it up. I’d have to buy carrots, wash them, and cut them up. I’d have to have a bowl where the peppers would neatly curve into a rainbow. I don’t own a bowl like that. We have large bowls with chips in them. Not chips that you eat, chips in the surface. I figure it gives them character so I have not replaced them. Here is how I generally serve snacks: they are all dumped on a paper plate and handed over, normally in a frenzied fashion because the kids begin to whine and complain that they are STARVING, which irritates me, because they don’t really know what it means to starve. “Eat up,” I’ll say, shoving the food at them so they’ll be quiet. Nothing is ever presented in an exciting fashion. I mean, sometimes I do use food coloring for things. I do make cut out cookies. But I do not make rainbow pepper bowls. I never make any of those fancy snack either. The fanciest I ever get is peanut butter and apples on a paper plate or ranch dip with carrots. It looks cute, but really. Why would you spend more time preparing that snack than they would spend eating it? I just don't get it! 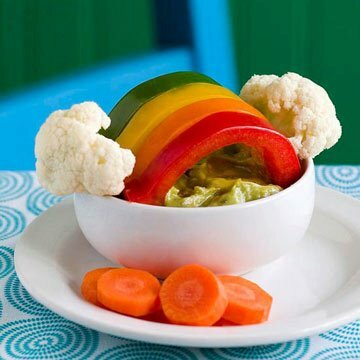 My kids don't like guacamole or peppers or raw cauliflower so really making a cute rainbow out of it will not get them to eat it ... ergo I don't. I think some people really enjoy making "fancy" snacks for their kids and have a natural talent for it. And for them, that's great. Then there's other moms who just want their kids to eat healthy foods and/or shut up long enough for us to cook the main meals, lol! Everyone messes up something in parenting children. I wouldn't stress over the "fancy" snacks you do or don't make! I don't do fancy things either. I don't need to trick her to eat with some fancy handiwork! I don't do things like that. I don't think my kids would have appreciated the effort. Some moms just go over the top. I wouldn't have time to do that. They are pretty, but I guess I don't see the point. I think they are cute but I would have never done it. Crap like that just serves to make me feel guilty about how crappy of a mother I was. I was in survival mode. Feed them to nourish them. If I made cute crap they wouldn't eat it. They were swords or guns or missiles. I got sick of them playing with their food. OMG - I would NEVER do that. I tried being all Martha and making castle and glass slipper pb & j for my child's last birthday. It was a nightmare. I want to pretend like I'm going to make the time to do all that fancy shmancy stuff...but I already know I won't. I am right there with you! That is why I even created a blog post with school lunch ideas called "I am not Martha: Easy School Lunch ideas"
I make things like this for a birthday party, holiday, or special occasion, but for everyday... no way! Wait. They are not supposed to eat the snacks right out of the bag????? Maybe I should just print up the picture, and tape it to the outside of their next snack. Voila! Isn't it pretty! My kids will probably roll their eyes, ask daddy if I had my medicine today, and look for the bag of cookies. We like pre-cut cookies too. We eat them out of the tube. The kids (and hubby) prefer if I, in fact, don't attempt to cook. That's daddy's job. He likes to attempt to plate their meals though. Because it makes it that much more fun to hear them whine about whatever it is that's on their plate. I don't make any of those fancy snacks either, it's too much work and too many ingredients that I will probably never use again. Ha ha.